Element Pictures Distribution has announced that the critical acclaim Irish drama will be released in the UK on March 8th. ‘Rosie’ made its world premiere last September at the Toronto International Film Festival (TIFF) and was subsequently named as one of The Hollywood Reporter Critics’ 25 favourite films from the Fall festivals. 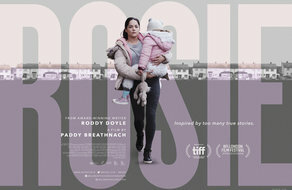 Paddy Breathnach (‘I Went Down’, ‘Viva’) directs ‘Rosie’, a film that explores the quietly apocalyptic ramifications of Ireland's housing crisis, from a screenplay by Roddy Doyle (‘The Commitments’, ‘The Snapper’) and starring Sarah Greene (‘Penny Dreadful’, ‘Rebellion’, ‘Black 47’) in the title role, alongside Moe Dunford (‘Vikings’, ‘Handsome Devil’) as her partner John Paul.